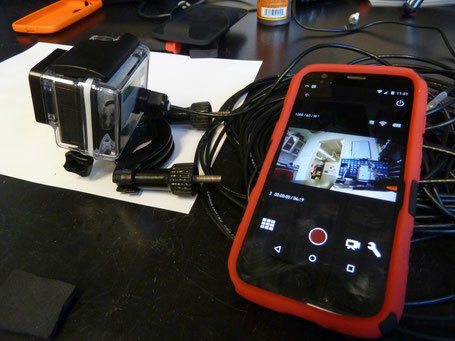 Typically a GoPro will connect to the GoPro app and allow live streaming via a WiFi signal. Unfortunately WiFi signals are quickly absorbed by water making it unable to connect to the camera. 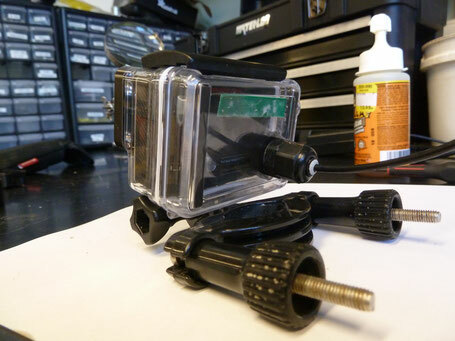 With this simple and cheap build, you can watch live video from your GoPro up to 50' underwater. The trick is getting the WiFi signal from the camera up to your wireless device. This build is roughly based on a YouTube video seen here. The company CamDo makes a commercial product based on this idea. If your willing to shell out the extra cash, or don't want to build it yourself, check it out. They also sell a lot of great GoPro add-ons. This build works by using two WiFi antennas to pass the signal from the GoPro to your wireless device running the GoPro app. While I used the items listed above, some of these items can be exchanged for other similar products. I would only advise that you pay attention to the compatibility between products (i.e. make sure the antenna fits into the housing and the cord grip will secure around the coax cable). Step 1: Drill a 1/2" hole in the BacPac backdoor. Step 2: Make sure the hole is free of any debris and install the cord grip. Tighten the nut on the backside. Step 3: Run the coax cable through the cord grip but don't tighten it down yet. Step 4: Solder the WiFi antenna onto the coax cable. This is the most difficult part of the build, only because the of the small, fragile cable on the WiFi antenna. To do this cut off the connector which comes attached to the antenna. Both the antenna cable and coax with have a main cable in the center and a shielding braid around the outside. These need to be soldered together. I found it easiest to tin all the wires with solder, then get a small bead of solder on my iron and use that to fuse the two. I used heat shrink to keep everything pretty. Do this for both ends of the coax cable. Step 5: Adhere the WiFi antenna to the inside of the backdoor. Clean up the wires and tighten the outer nut on the cord grip. The GoPro end is now done. I found that I had to add a small piece of foam inside the backdoor to keep the GoPro properly positioned in the housing. Before you put this underwater I would strongly recommend that you test the housing before you add the camera. If there is a leak it is better to find out and fix it without the camera inside. I take no responsibility for flooded cameras. I have used mine several times down to 40-50'. I am not sure the exact depth rating of the cord grips. Additionally, I have only tested a 50' cable. Longer cables maybe possible depending on the attenuation of the WiFi signal. Step 6: Set up your topside device. This part is going to vary on the user and the device which they chose to use. For my build I used my cell phone (Motorola Moto G). As previously stated, any device capable of running the GoPro app should work. Place the topside antenna behind your device. I found that I got a much better signal from the GoPro when I placed the WiFi antenna at the top of my phone near the camera. I am assuming that this is where the WiFi chip is located on my phone. Remember to test this with the GoPro underwater. If the GoPro is out of water the WiFi signal will be traveling through the air and you won't be able to locate the proper placement of the antenna. 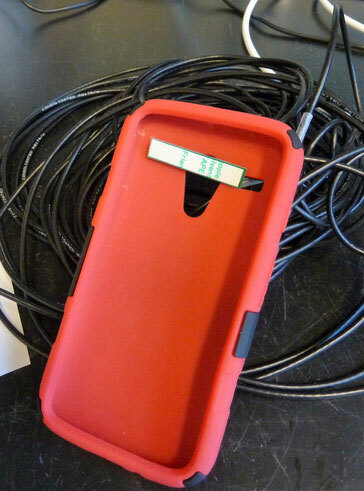 For my application I bought a separate phone case which I glued the antenna to the inside of the case and epoxied the wires along the outside. Once the GoPro is paired to your device via the GoPro app you are done! Test it out, modify it and let me know how it goes! You can even take this a step further and stream this live over the web via the periscope app (iPhone only at this point). Remember to check your cell phone data plan if you attempt this. Are you able to share a link for the wifi antenna you have used please? I used the antenna from adafruit. Hi - why did you drill the hole in the GoPro housing and place the antenna on the inside? Wouldn’t it work just as well if you glued it to the outside? 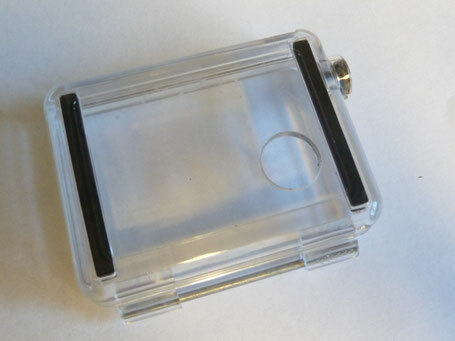 The signal passes through the plastic housing? Curious to hear the answer to Arne's question. 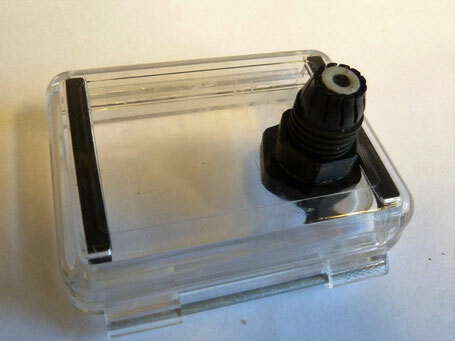 If you glue the antenna to the outside/back of the (regular) GoPro door and then make the whole antenna/coax connection waterproof, would that work? I don't see why that wouldn't work. Try it and let me know. Will try and post later. Is there any way to get the GoPro single camera to live stream to a VR headset for android Z2 Play or Force....? It is so bright by the water here in Florida, and it is hard to see the phone screen. A VR headset would be so nice and dark to be able to see the screen vividly. I'm just not sure the GoPro app could split the screen for a VR headset in real time live stream. Brett, I think that using a VR headset is a great idea. Unfortunately I haven't tried one. The challenge would be streaming it directly to the headset without having to process the images first, which is possible but makes everything much more complicated and expensive. I don't know how to get the frame information out of the GoPro software. There are some people working on it. (https://github.com/KonradIT/goprowifihack). You might want to look at some of the video headsets that are available which the drone pilots use. They have an HDMI input, then you would have to get an HDMI out of your phone or tablet. Just some thoughts. Please post, if you come up with anything. Cool I will try ! Hi. How exactly did you wire the mini antennas? The antenna in the gopro is receiving but the one next to the tablet is transmitting right? Or are they both transmitting? So does the wiring change or are they identical? 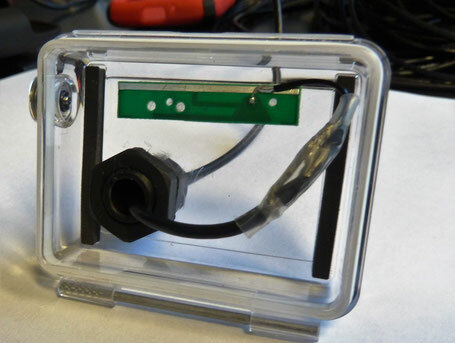 For example, on the gopro end I assume the antenna positive goes to the central core of the coaxial cable while the negative (ground) goes to the shielding. So is it identical at the other end? Your help would be appreciated. Best regards, Kevin. They are both transmitting and receiving. Simply wire them both identically on each end. Positive to central core, and negative to the shield. Thanks for the info. 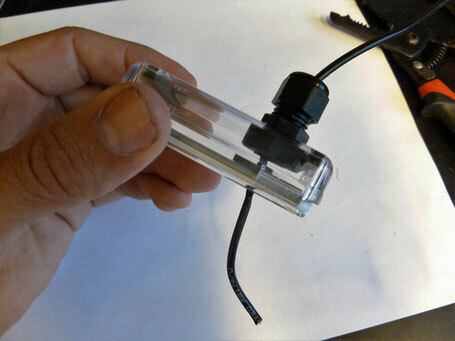 Could you please provide a source or part number for the submersible cord grips, please? You said you tested your kit down to 40 or 50 feet, which is pretty good. I bought a 100 foot reel of coax cable, wondering at what point pressure would cause the cable grip to fail. I'm wondering if Arne tried it outside of the case. It's electronics so he would have needed to water proof the antenna and connections... which I imagine would cut down on the signal strength. Also wondering if Rich Obrey has tried the 100 foot one yet. Maybe try it first without the camera in the housing down to 100 feet. I'm toying with the idea of doing this and attaching it to a crab pot so I can watch what is going on while I wait for my dinner. Videos pull in more rush hour gridlock and with the assistance of the recordings, customers can take in more about the organization and its items. Customers love watching recordings since they can comprehend the thing in a basic and simple way. <a href="https://brandlitic.com/how-to-use-periscope-for-marketing-and-drive-sales/">periscope marketing</a> will go about as an immense favorable position on the off chance that you utilize it as a piece of the video promoting technique. That's pretty awesome. I've read someone else doing something similar but they did not use the antennas. They are just sticking the coax to a tablet and the other end to the outside of the go pro case. Seems odd but it would definitely be a lot easier to do with a Hero 5/6/7 since they don't offer a different backing for these models. Has anyone else tested this without the antennas? I am curious to know what advantage this gives you? 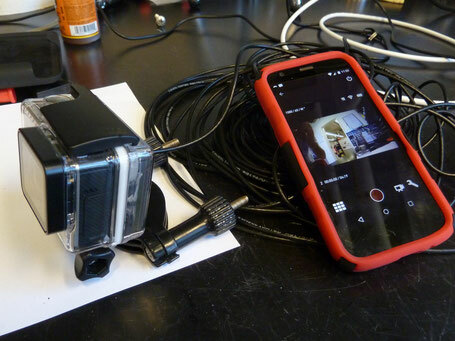 Taking a wireless camera, and adding a wire to it makes it ... well a wired camera. Of which their are bucket loads on the market that will happily interface with your phone or tablet and broadcast app. Using a GoPro black5 and rga174cable,20 mtr. long and stripping 2.5 inch either end and fixing to outside of GoPro housing at the top and the other end to an iPad worked. Sweet spot near screen button on iPad screen. This was so simple but worked surprisingly well. I want to solder the RG174 cable directly to the antennae rather than make a join with the short pre-attached lead. I can see that one wire goes to the long upper metal strip on the antenna, and the other goes to the solder point on the green PCB, but I can't see in the pics which wire goes to which. I would guess the outer shielding wire would go to the metal strip and the inner core wire to the splder point, but can you confirm this? 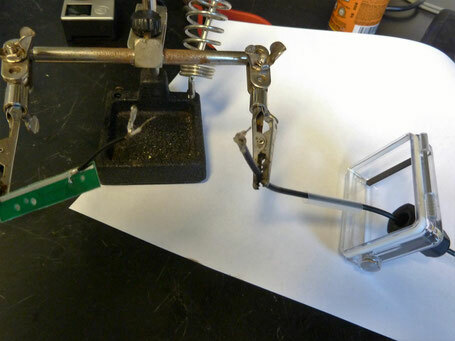 You are correct, the outer shielding wire goes to the metal strip while the inner core goes to the solder point. Sean Lewis, think ice fishing. Where did you get the submersible cord grip? I connected cable direct to antenna, 3D printed a housing for both wifi boards. Used 2 way tape to secure on gopro housing and phone, works awesome. If you want stl and instructions let me know a I'll post on Thingiverse. Brent, I got that one on McMaster-Carr. Just match the diameter of the coax cable to the cable grip specs. Hey Chuck, did you post on thingverse? I’d love to print one too, thank you!